Note1 : We will assume here the heating element reaches its ﬁnal temperature immediately upon the application of power, with no lag time of its own. 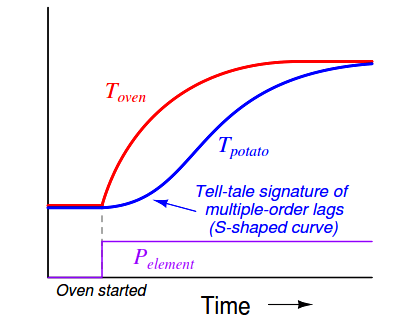 The potato forms another ﬁrst-order process, absorbing heat from the air within the oven (heat transfer by convection), gradually warming up until its temperature (eventually) reaches that of the oven (Note1) . 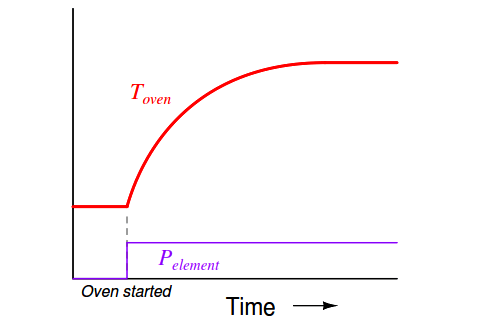 From the perspective of the heating element to the oven air temperature, we have a ﬁrst-order process. From the perspective of the heating element to the potato, however, we have a second-order process. Note 1 : Given the presence of water in the potato which turns to steam at 212 deg F, things are just a bit more complicated than this, but let’s ignote the eﬀects of water in the potato for now! Intuition might lead you to believe that a second-order process is just like a ﬁrst-order process – except slower – but that intuition would be wrong. Cascading two ﬁrst-order lags creates a fundamentally diﬀerent time dynamic. In other words, two ﬁrst-order lags do not simply result in a longer ﬁrst-order lag, but rather a second-order lag with its own unique characteristics. This, in fact, is one of the tell-tale signature of multiple lags in a process: an “S”-shaped curve rather than the characteristically abrupt initial rise of a ﬁrst-order curve. 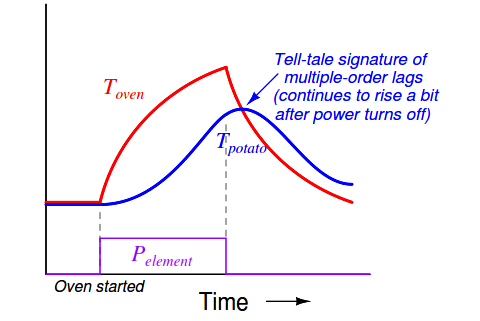 Note how the air temperature trend immediately reverses direction following the cessation of power to the heating element, but how the potato temperature trend continues to rise for a short amount of time (Note2) before reversing direction and cooling. Here, the contrast between ﬁrst-order and second-order lag responses is rather dramatic – the second-order response is clearly not just a longer version of the ﬁrst-order response, but rather something quite distinct unto itself. 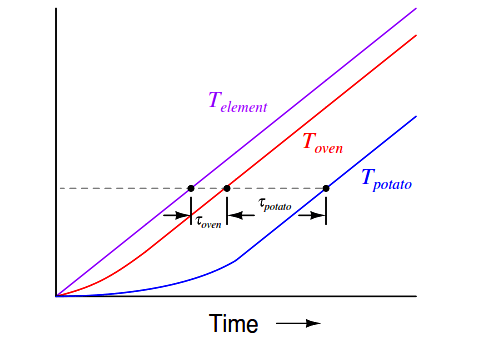 Note 2 : The amount of time the potato’s temperature will continue to rise following the down-step in heating element power is equal to the time it takes for the oven’s air temperature to equal the potato’s temperature. 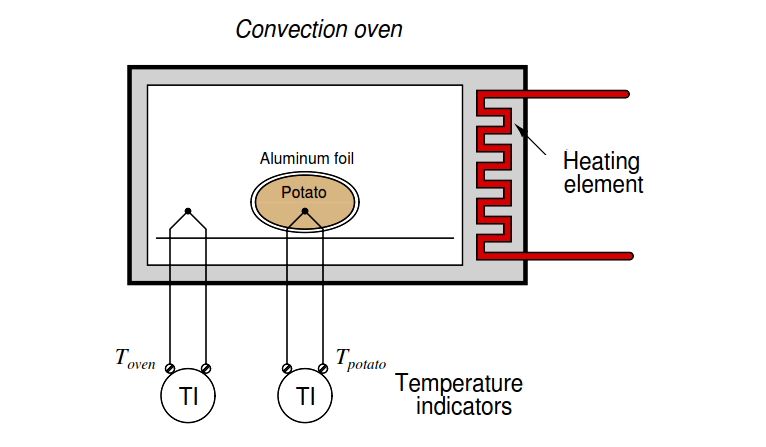 The reason the potato’s temperature keeps rising after the heating element turns oﬀ is because the air inside the oven is (for a short time) still hotter than the potato, and therefore the potato continues to absorb thermal energy from the air for a time following power-oﬀ. This is why multiple-order lag processes have a greater tendency to overshoot their setpoints while under automatic control: the process variable exhibits a sort of “inertia” whereby it fails to switch directions simultaneously with the controller output. From the perspective of the level transmitter on the last vessel, the control valve is driving a third-order process, with three distinct lags cascaded in series. This would be a challenging process to control, and not just because of the possibility of the intermediate vessels overﬂowing (since their levels are not being measured)! When we consider the dynamic response of a process, we are usually concerned primarily with the physical process itself. However, the instruments attached to that process also inﬂuence lag orders and lag times. As discussed in the previous subsection, almost every physical function exhibits some form of lag. Even the instruments we use to measure process variables have their own (usually very short) lag times. Control valves may have substantial lag times, measured in the tens of seconds for some large valves. Thus, a “slow” control valve exerting control over a ﬁrst-order process eﬀectively creates a second-order loop response. Thermowells used with temperature sensors such as thermocouples and RTDs can also introduce lag times into a loop (especially if the sensing element is not fully contacting the bottom of the well!). This means it is nearly impossible to have a control loop with a purely ﬁrst-order response. 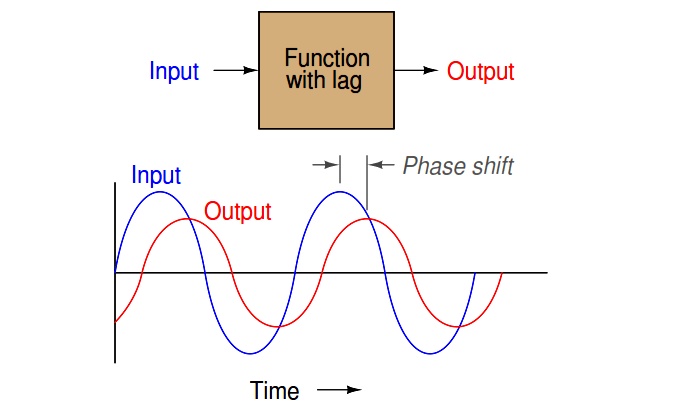 Many real loops come close to being ﬁrst-order, but only because the lag time of the physical process swamps (dominates) the relatively tiny lag times of the instruments. 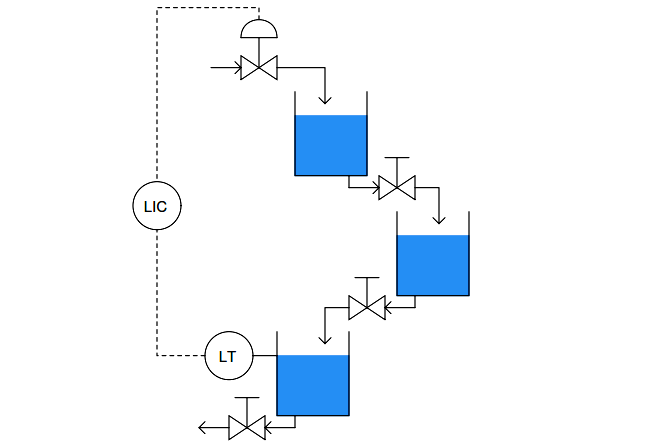 For inherently fast processes such as liquid ﬂow and liquid pressure control, however, the process response is so fast that even short time lags in valve positioners, transmitters, and other loop instruments signiﬁcantly alter the loop’s dynamic character. The phase shifts of multiple, cascaded lag functions (or processes, or physical eﬀects) add up. This means each lag in a system contributes an additional negative phase shift to the loop. This can be detrimental to negative feedback, which by deﬁnition is a 180 deg phase shift. If suﬃcient lags exist in a system, the total loop phase shift may approach 360 deg, in which case the feedback becomes positive (regenerative): a necessary condition for oscillation. The ampliﬁer works just like a proportional-only process controller, with action set for negative feedback. The resistor-capacitor networks act like the lags inherent to the process being controlled. Given enough controller (ampliﬁer) gain, the cascaded lags in the process (RC networks) create the perfect conditions for self-oscillation. The ampliﬁer creates the ﬁrst 180 deg of phase shift (being inverting in nature), while the RC networks collectively create the other 180 deg of phase shift to give a total phase shift of 360 deg (positive, or regenerative feedback). In theory, the most phase shift a single RC network can create is −90 deg , but even that is not practical. 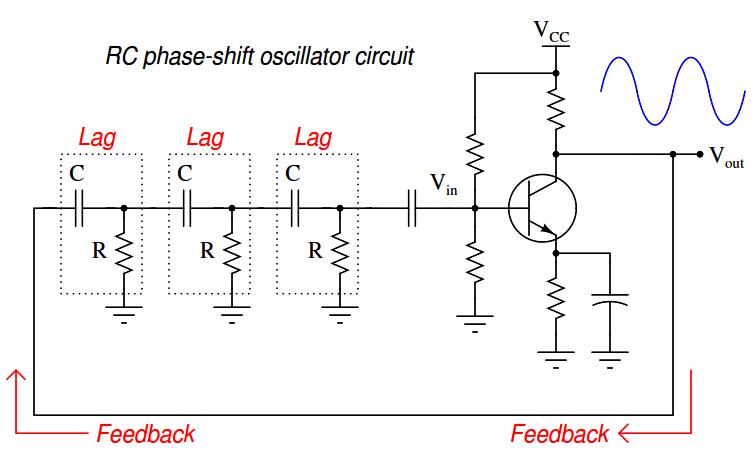 This is why more than two RC phase-shifting networks are required for successful operation of an RC phase-shift oscillator circuit.